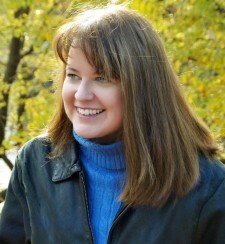 We’d like to give a rousing welcome to Clare O’Donohue, author of the Someday Quilts mysteries. 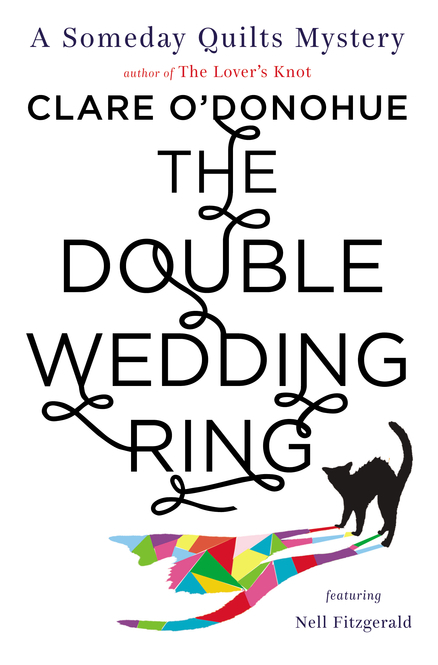 The fifth book in the series, The Double Wedding Ring, was released Sept. 24. Clare is also the author of the (so far) two-book Kate Conway mystery series, an edgier series in which the protagonist is a TV producer. In The Double Wedding Ring, Nell Fitzgerald’s future is on her mind, and it looks as though the pieces are coming together like a perfectly made quilt. Her relationship with Archers Rest police chief Jesse Dewalt is heating up, she’s thinking of starting her own business, and Grandma Eleanor is about to get hitched. But just when the future seems sewn up, Jesse’s former NYPD partner turns up—dead. Clare decided to participate in the Deb interview. Welcome, Clare! Storytellers usually have a story about how they came to write. What’s yours? I’ve always been a storyteller. When I was four or five I would tell my sister stories about the people who lived under our beds. When I was fifteen I took my first stab at writing fiction on my mom’s electric typewriter. It was a mystery. After college I worked as a newspaper reporter, columnist, and then as a television producer—always writing. I finally wrote my first novel, The Lover’s Knot, in late 2006 and early 2007. After so many years of writing in the strict formulas of newspaper and TV, I wanted to see if I had my own voice. And that turned into now seven novels, and two novellas. You write two book series. What attracts you to series? How do you keep track of your characters, and how do you let them grow? Writing series books was really my publisher’s idea, as it’s easier to build an audience that way. But I like revisiting the same people and building on what’s there, so it’s been fun to have that experience. Keeping track of the characters is easy—it’s like having lunch with one friend, dinner with another. I know what world I’m in when I’m there. And I guess I don’t let my characters grow—they insist on it. Which mystery authors do you recommend? Ugggh. So many. Elmore Leonard created really specific, fully realized worlds in his books. Donald Westlake wrote real people, some funny, some dark—with equal skill. He’s one of my favorites. I also love much of Janet Evanovich’s work. And you can’t go wrong with Agatha Christie. Have you ever met one of your own literary heroes? I was lucky enough to co-chair the Mystery Writers of America Librarian’s Breakfast at last year’s Bouchercon World Mystery Conference. Mary Higgins Clark was our guest of honor, which blew me away. I’m a huge fan, and in introducing her, I got to tell a story about the first Mary Higgins Clark novel I read. Years ago, I was on a beach vacation. I’d finished the novel I was reading, so I grabbed one from the stack my friend had brought along. It was one of Mary’s books. I intended to read for about twenty minutes before heading out of the sun. (I’m very pale, and even with sunscreen I probably shouldn’t sit near a 60-watt bulb, let alone sunbathe). I read a few chapters, then a few more, turning page after page until I got so lost in the story I forgot where I was. When I rested the book on my lap, it hurt. I looked at my legs—and you guessed it—I was a lobster. At the librarian’s breakfast I had the wonderful opportunity to let Mary know how dangerous her books can be! Any advice for first-time authors as their books near publication? Know that you’re in charge of your career. Big publisher, indie publisher, self-publisher—it doesn’t matter. You have to shape your brand and market your books. Get the best website you can afford, plan a budget for marketing, go to conventions in your genre, meet other authors and booksellers. Ask what’s worked for other people and try those things yourself. And write the next book. What about for someone struggling to get started? If you’re struggling to write the book, my advice is the standard, and wise, write badly. Just write something. Sometimes when I’m stuck I write a “placeholder” scene, something I know will change but it moves me forward. If you’re struggling with the marketing, find other authors who are in your position and/or slightly ahead of you. Offer support, ask questions, buddy up. Writers have a reputation for being lone wolves, but the truth is we benefit from helping each other. What do you write that’s dangerous? Have you ever met one of your heroes? GIVEAWAY! Comment on this post to be entered to win a copy of The Double Wedding Ring! Follow The Debutante Ball on Facebook and Twitter for extra entries—just mention that you did so in your comments. We’ll choose and contact the winner on Friday. Good luck! US shipping only, please. Clare O’Dononue was born in Chicago. She is a TV producer, working on shows for The History Channel, truTV, Food Network, A&E, Discovery, TLC, and others. Her big break in TV was writing for the HGTV series Simply Quilts, and her big break in writing was the Someday Quilts series, starting with The Lover’s Knot in 2008, and followed by The Drunkard’s Path, The Double Cross, and The Devil’s Puzzle. Visit Clare at http://clareodonohue.com/ and follow her on Twitter. Hi Clare! I felt your pain–I can’t tell you how many times I’ve sat too long in the sun reading a good book. Reading can indeed be dangerous! I love the idea of writing a placeholder scene to move myself forward in a first draft. Do you have any tips to revisions–especially the dreaded muddle in the middle? Revisions – love ’em and hate ’em. I love that there’s already something on the page, but that doesn’t always mean small cuts – sometimes it means realizing that there’s restructuring involved, or favorite line or scene must be cut to move the story forward. It can be hard to eliminate what you worked so hard to put there in the first place. As I’m re-writing I am looking for that gut feeling that something works, or doesn’t work, and if it’s especially painful to let something go, I cut and paste it into a “maybe someday” folder I keep on my laptop, of scenes and lines I might someday use somewhere else. I’ve never used anything I put there but it helps ease the pain. Clare is one of my literary heroes, because she writes books and has a day job. A hero for the ages! If you haven’t read her books, you’re in for a treat. I love them all. Thanks for being on the site today, Clare! OK, wait, you write two series AND still work a day-job? How do you schedule your time, manage it all (plus social media presence and promotion), keep up your energy? I’m going to employ the “someday maybe” method of cutting. That’s a great idea. Okay, maybe not alcohol. I have no idea. That’s the honest truth. It’s only when people say it that it sounds like a lot of stuff going on at once. And, by the way, for as busy as I sound, I get an awful lot of TV watching in. Double thumbs up Clare — can hardly wait to get my hands on this book!!!!! I love to read and get lost in the books I read, but have no desire to write. Always glad to find books to get lost in and Clare your books are ones that I can do that with. Thanks Ellen. I love to get lost in a book too! I was fascinated by this post. Clare is very talented and creative with two series which sound captivating and special as well as being a TV producer. this must be a most rewarding and lovely career. Wishing you much continued success and adventures in writing. I follow on facebook. Thanks Sharon. It is a terrific career, and I’m very lucky to have work doing two things – TV and books – that I love. I love your advice— “know you’re in charge of your career”. I think it’s easy for writers to feel helpless at times, as if they have no control over what comes next for them. It’s timely advice for me right now! I really enjoyed your interview, Clare. Thanks Heather. I learned after a few novels that I was, in essence, a small business owner. I had to make decisions about my time, money & publicity efforts that fit my short and long term goals. I love writing but realizing I was also in business made me think differently and I hope, helped me make smarter choices. Good luck! I love that you are always willing to offer advice to new or aspiring writers! I love your advice for first-time authors, Clare. Sometimes I feel so star-struck by everyone around me that it’s easy to agree with everything they suggest, but you’re right that we have to take charge (and be confident enough to do so).